A special panel recommending changes to the state’s public school testing and accountability system has stopped short of proposing that Texas scrap the controversial assessment regime known as STAAR. A special panel charged with suggesting changes to the state’s testing and school accountability system will recommend that state lawmakers implement a series of individualized, computer-based exams to measure student performance and progress throughout the year. But at its final meeting Wednesday, the 15-member Commission on Next Generation Assessment and Accountability opted to strike a line from its draft report saying those tests should “replace the current STAAR assessment program,” with members acknowledging that many schools don’t have the technological infrastructure, including broadband Internet, for digital testing. A periodic, computer-based testing regime, something many school districts already employ, would “provide useful, real-time feedback to educators, parents and students,” according to the panel’s draft report to the Legislature and Gov. Greg Abbott. The panel, whose recommendations are not binding, is charged with producing a final report by Sept. 1, five months before lawmakers reconvene in Austin to take up the issue. “I don’t think any of us is recommending getting rid of STAAR tomorrow,” said the panel’s chairman, Andrew Kim. The Comal schools superintendent said there will still need to be one summative test at the end of the year — “whether it be STAAR or something else” — because federal law requires states to administer a statewide exam. Wednesday’s vote on the report was 9-1, with five commissioners absent and the head of an influential anti-testing group casting the lone no vote. Theresa Treviño, president of Texans Advocating for Meaningful Student Assessment, said she "really had to make a statement" because she felt that none of the 14 recommendations in the report sought to limit the high-stakes components of the state’s current testing and accountability system. 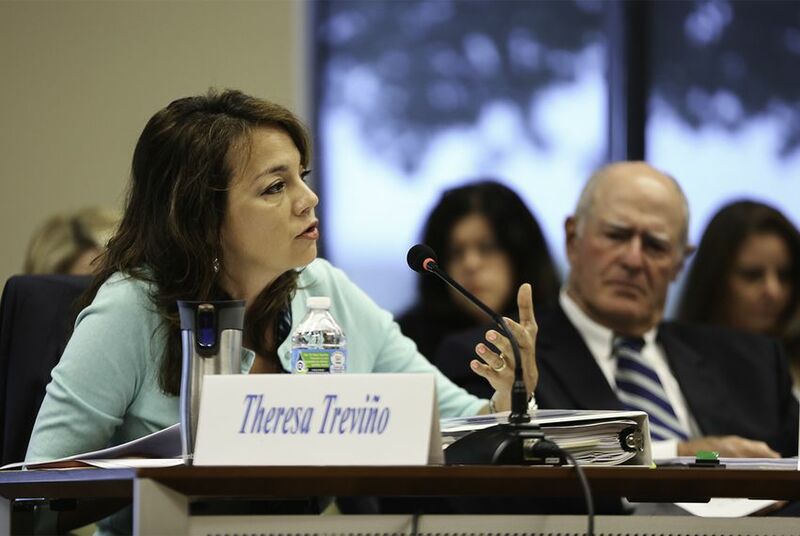 Treviño said she might have voted in favor of the report if the commission hadn’t struck the sentence saying the recommended “computer-adaptive assessment system” would replace the widely disdained STAAR tests. But she said her main concern was that the report doesn’t recommend removing requirements that 5th and 8th graders pass reading and math exams to move on to the next grade — or that high schoolers pass five end-of-course exams before they can graduate. “We are one of only 14 states that require high stakes for graduation,” she said. A recent survey organized by State Board of Education Chairwoman Donna Bahorich found that a majority of educators, parents and students support eliminating all statewide testing and overwhelmingly oppose those high-stakes requirements. The recommendations do not include the massive changes many parent and teacher groups are looking for, something many of the commissioners acknowledged in closing remarks Wednesday. "It's not a perfect set of recommendations by any means," said commissioner Pauline Dow, the chief instructional officer for North East schools in San Antonio. "I think it’s sort of part of our duty to also help stakeholders recognize that [testing and measurement] is a complex issue and that we have to think about it in that way."